From NOVA TOTIVS TERRARVM ORBIS GEOGRAPHICA AC HYDROGRAPHICA TABULA. Auct- Henr- Hondio. View all the images in NOVA TOTIVS TERRARVM ORBIS GEOGRAPHICA AC HYDROGRAPHICA TABULA. Auct- Henr- Hondio. Full Title: Map - Page 1 - NOVA TOTIVS TERRARVM ORBIS GEOGRAPHICA AC HYDROGRAPHICA TABULA. Auct- Henr- Hondio. Full Atlas Title: NOVA TOTIVS TERRARVM ORBIS GEOGRAPHICA AC HYDROGRAPHICA TABULA. Auct- Henr- Hondio. This antique map (Map - Page 1) and atlas (NOVA TOTIVS TERRARVM ORBIS GEOGRAPHICA AC HYDROGRAPHICA TABULA. Auct- Henr- Hondio.) 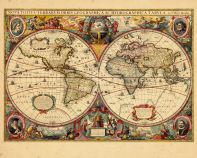 are part of the Historic Map Works, Residential Genealogy™ historical map collection, the largest digital collection of rare, ancient, old, historical, cadastral and antiquarian maps of its type. We currently have over 1,662,956 images available online. You can read about the collection or browse the entire collection.